With over 20 years of expertise, Roadway Removals has progressively built on a foundation of knowledge and experience to provide one of the leading interstate removalist services in Australia. Our professional furniture removalists have been in the game for so long that they know the business in and out; we will handle any doubts or questions you have with confidence and ease. Our consistent success in the competitive removalist industry is largely due to our repeat customers and positive word-of-mouth referrals, so you undoubtedly know your personal effects will be in good hands when it comes to the specific need of professional Logan to Perth removalists! We are all you need for a guaranteed smooth transition from Logan to Perth! With over 20 years of interstate removalists experience, our team has developed great expertise in handling all kinds of moves. Whether you are expecting a small or big move, Logan to Perth Roadway Removalists will dutifully handle all your items with care and respect. Roadway Removals is more than happy to take the pressure of moving interstate off your shoulders; we can help you engineer the smoothest move possible. Get an online quote today! 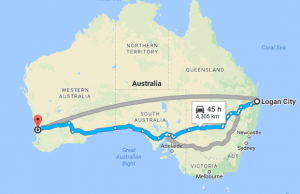 If you need reliable Logan to Perth removalists, Roadways Removals is ready to get the whole process on the way today!